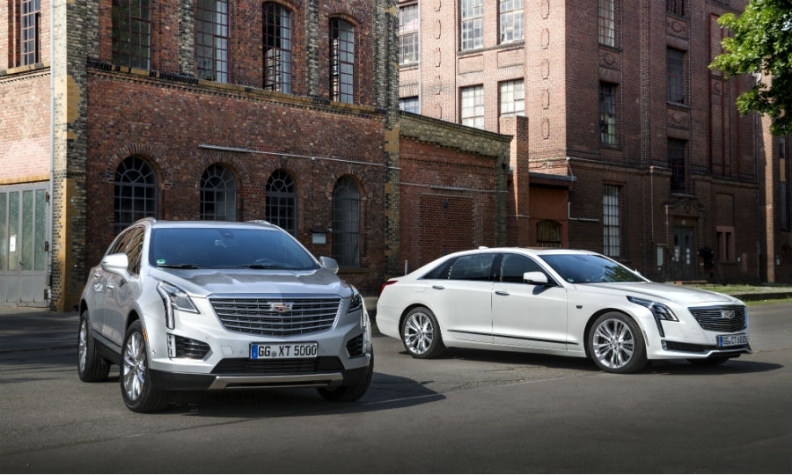 The CT6, right, and the XT5, left, will lead Cadillac's latest European sales push..
BERLIN -- Cadillac is launching two new models and expanding its dealer network in Europe in a renewed sales push in the region against entrenched premium rivals BMW, Mercedes-Benz and Audi. But the General Motors luxury brand’s latest European sales target is modest compared with past goals that were never achieved. In 2006, GM predicted it would sell 20,000 Cadillacs in the region by 2010, up from 2,019 in 2005. Cadillac bet heavily on its BLS, a midsize sedan based on the Saab 9-3 but the BLS was a flop. Cadillac now aims to reach annual 5,000 sales in Europe by the end of the decade. The forecast includes GM’s Corvette and Camaro sports cars, which are sold in the same dealerships as Cadillacs. Last year, GM sold 1,131 Corvette and Camaro models and 579 Cadillacs in Europe. Leading the brand’s product offensive will be the CT6 large sedan, the brand’s new flagship model, and the XT5 midsize SUV, a replacement for the SRX. "We want organic growth," Barnabas Vincze, Cadillac's European manager for advanced planning and product marketing, said at an event here. Key to growth is expanding the brand’s dealer network, he said. "We sell in 12 European countries. Certain countries only have one dealer. That's not the right basis to do business." Cadillac has struggled in Europe to compete with the big three German premium brands, BMW, Mercedes and Audi, which together take about 85 percent of the region’s premium market. Vincze said Cadillac will remain a niche brand in the region. Cadillac will not offer diesel models despite the huge popularity of diesels among European premium buyers. Diesels account for half of Europe’s new-car sales with an even higher share in some premium segments. Cadillac also will not build right-hand-drive versions to sell in the UK, Europe’s second-largest premium market after Germany. Currently, the brand’s three biggest European markets are Germany, Switzerland and Sweden. Cadillac executives say the brand aims to win over European customers by offering gasoline-only cars loaded with equipment and marketed as a good-value, “leftfield” alternative for wealthy urban dwellers who want to be seen driving something different from German premium models. Future Cadillacs will improve fuel economy so the brand can compete against the dominant diesel, Vincze said, without going into detail. The CT6 and XT5 will be available in Europe starting September 5. The CT6 will be priced between 73,500 euros and 94,500 euros in Germany. The XT5 will be priced between 48,800 euros and 66,800 euros. The CT6 will eventually be available as plug-in hybrid, sources close to GM have said. Currently the most fuel efficient engine Cadillac offers in Europe is a 2.0-liter turbocharged four-cylinder unit in the ATS and CTS sedans. There are no plans to fit this engine in the CT6 or XT5, which use V-6 gasoline engines, Vincze said. GM has established a new European unit to market and distribute its cars. The brand’s former importer, Kroymans, crashed in 2009. A new European head, Felix Weller, starts work at the beginning of September. Weller had been in charge of Cadillac’s sales and marketing in the Middle East and has also worked for Audi and Mercedes in various positions in sales and dealer strategy.